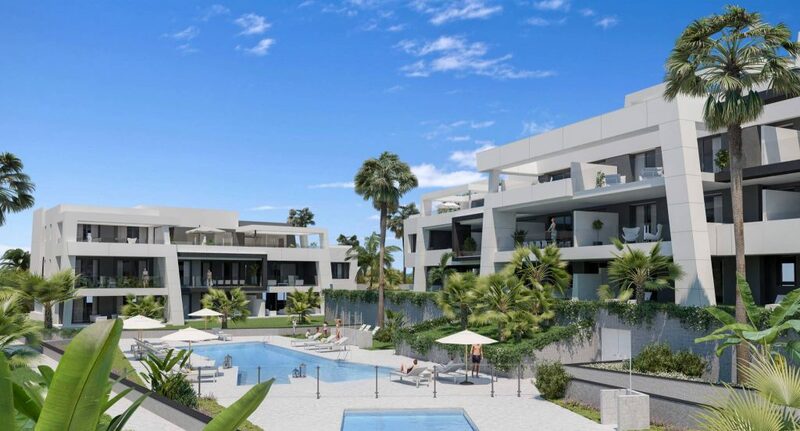 Vanian Green Village in Estepona, a new development by AEDAS Homes, backed by foreign capital. Click for more information. High excitement reigned at the Madrid Stock Exchange in October just as it had at the end of March. Late October saw the floatation of Aedas Homes, following in the footsteps of the March flotation of Neinor Homes, whose shares went up by 7.2% on the day. The Spanish property sector watched the operations with great interest as they’re the first stock market flotations of Spanish home builders in ten years. And they reflect the return of growth in the property sector after leaving the crisis behind. But they also represent a new business model that has appeared on the property scene: one backed by foreign investment, as is the case with Aedas Homes and Neinor Homes. As a result, the foundations of the property market crumbled, “a situation that wiped out almost 95% of developers,” Echavarren points out. According to figures from the Central Business Directory (Dirce in Spanish), the number of property developers in Spain dropped from 106,375 in 2008 to 70,446 last year, almost 36,000 fewer. Borja Ortega, a consultant at JLL, adds that “developers used to have very rigid structures, and a strong resistance to change”. The crisis has brought common sense back to those in the property business, “who have had to adapt to the new scenario,” says Echavarren. The way banks work has changed dramatically and finance is not as flexible as it once was. To buy residential land nowadays you need to have your own capital, which means banks have lower exposure than before. “Banks don’t provide loans for any project that isn’t shown to be viable, with guarantees of pre-sales before construction starts and that has the right licences. There’s much tighter control nowadays, which means the previous risk of a development failing is much lower,” Echavarren explains. In summary, banks have become experts in analyzing and controlling risk, and keep a close eye on projects right until they’re sold to the buyer. A developer’s technical and financial solvency is put under the microscope. Banks make sure that the money for land is spent on the plot and not on another one, as used to happen. In short, the property sector is protecting itself from risks and this new scenario allows room for both well-known brands as well as new ones such as Aedas Homes, Aelca, Neinor Homes and Vía Célere, who have all made the most of the new wave of activity. These four developers have in common the backing of an investment fund, a business model that guarantees capital for land purchase and reduces exposure to the banks. However, it is bound by the demands of the regulations for this type of fund. These investment vehicles have very high transparency requirements and cannot allow themselves to be shown to be linked to a property company accused of planning irregularities. In the US, regulations on this aspect are particularly strict. The way a fund works also needs to be taken into account. When it enters a company’s shareholders it does so on a temporary basis, for a few years, and takes the developer to the natural conclusion of floatation on the stock exchange to raise capital. Once the capital objectives have been met, the fund sells its shares and leaves. A fund therefore doesn’t form part of a company unless it sees clear guarantees. This has been the route taken by the Lone Star fund over the last few years in Neinor Homes. In 2015, Lone Star bought the company, which included Kutxabank property assets. When the property company started trading on the stock exchange in March, the fund reduced its share to around 40% and in September, it got rid of 27%. In the latest sale, the American fund saw a capital gain of more than €166 million. The company has bought land to build 12,000 homes. “Demand is solid, but supply is falling in the central areas of Madrid and Barcelona,” Velayos warns. One of the main problems facing the property sector at the moment is the lack of land in Madrid and Barcelona. This has led companies like Neinor and AEDAS to look for new opportunities in areas such as the Basque Country and the east of Spain.